And then there's the multinational conglomerate wire services, which, hint-hint.... farm their orders out to, you guessed it, local florists. You end up paying a whole lot more than you deserve to. Instead of all that, take a look at what Bloomex offers. Here are eight great reasons to use us for your flower delivery needs in Canada. 1. QUALITY. Our flowers arrive straight from the farm to our production facilities, which are located in eight major markets across the countries. That means fresher products. 2. VARIETY. We have hundreds of bouquets and arrangements for you to choose from. But did you know that in addition to fresh cut flowers, we specialize in gift baskets, spa baskets, chocolate, gourmet foods and more? Forget the rest. Go with the best. 3. CONVENIENCE. Point, click, order... it's as simple as that. Not sure exactly what you're looking for? Check out our popular Designers Collection, which puts the decision-making in the hands of our talented florists and floral arrangers. 4. PRICE. 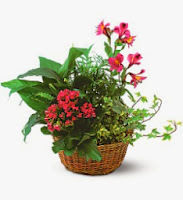 The flowers wire services and local florists get their flowers through a convoluted system of wholesalers and/or importers, and there are margins to be made at each step of the process. Cut those middlemen out, and it results in a lower cost for the consumer. We pass those savings on to you. 5. CUSTOMER SERVICE. Our operators are standing by to help. And if its the middle of the night, try our online chat system or shoot us an email. We always strive to live up to our company motto of "We care." 6. ORDER AHEAD. Hey, we're all forgetful sometimes. Take the worry out of the process by placing your order ahead of time, for delivery on a specific day. 7. WE DELIVER ALMOST ANYWHERE. Unless you're stationed in Alert, there's a pretty good chance that we can get your flowers to your loved one. 8. WE'RE CANADIAN. We were established in Ottawa in 2005 and provide quality work for Canadians in eight major markets. We really are Canada's National Florist.